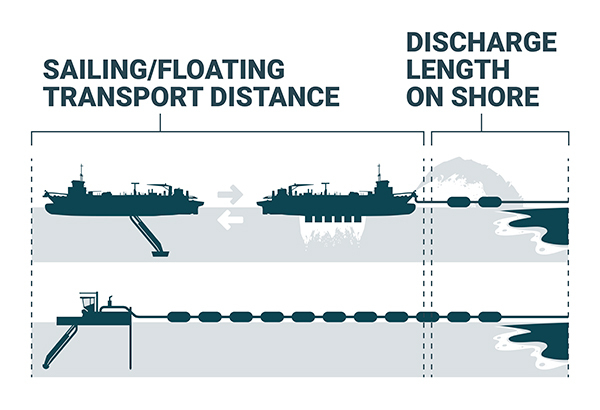 Glossary of dredging terms for quick reference. This tool enables you to determine if a trailing suction hopper dredger (TSHD) or a cutter suction dredger (CSD) is the most suitable vessel for your project. By filling in basic project characteristics, production details and operational time, the required production in m3 per hour will be calculated. In addition, a recommendation will be given for a CSD and/or TSHD with the optimal discharge diameter, or hopper capacity, for your operations. please fill in the contact form, once you press the calculate button in step 3. Note: Limiting factors such as swell, current, traffic and channel depth can have an influence on which type of equipment is suitable for your project. The calculation is just an indication, and no rights can be derived from it. The optimal equipment for your project is chosen by taking into account factors such as capital cost, fuel costs, crew, repair, and maintenance and insurance. Complete the contact form below and our dredging experts will be in touch with further advice. With your input, they can make a detailed calculation relevant for your request.